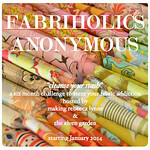 When I saw that Shannon Brinkley was doing a quilt-a-long for her scrappy skyline patterns I jumped at the chance. I have loved her world map quilts for a while now, and the quilt-a-long was a good opportunity to give her Scrappy Appliqué technique a go. It is a fun and pretty easy technique for the most part. 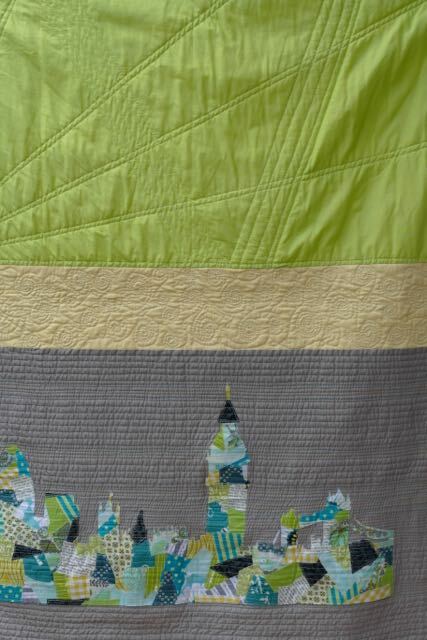 I loved pulling fabrics from my scraps and then cutting out the London skyline. My biggest difficulty came when I needed to appliqué the skyline to the quilt top. I didn't have any stabiliser, and so trying to satin stitch or even zig-zag stitch around the outline made everything pull out of place. In the end I just did raw edge appliqué and used some Fray Check so that hopefully all the little details won't disappear over time. 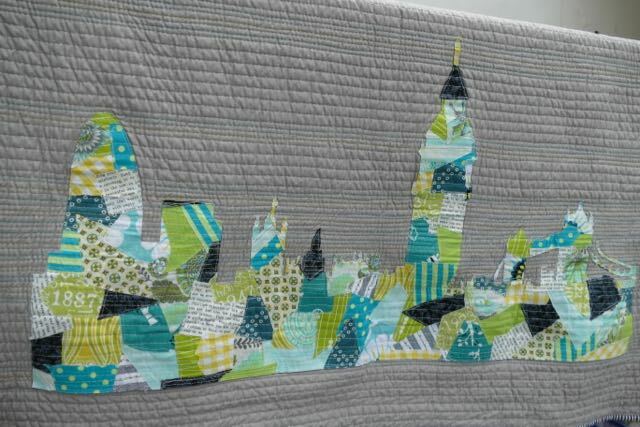 I also quilted over the skyline with matchstick quilting, using three different colours of Aurifil thread. 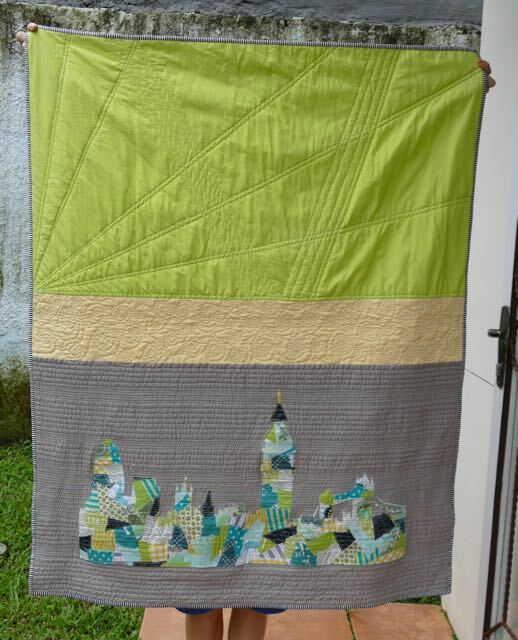 The quilt was still looking a bit plain so I enjoyed practicing some FMQ swirls, and then went back to straight lines in the green section to try to draw the eye towards the skyline! I used a long hoarded fabric for the back, and resorted to stripy binding - always one of my favourites! 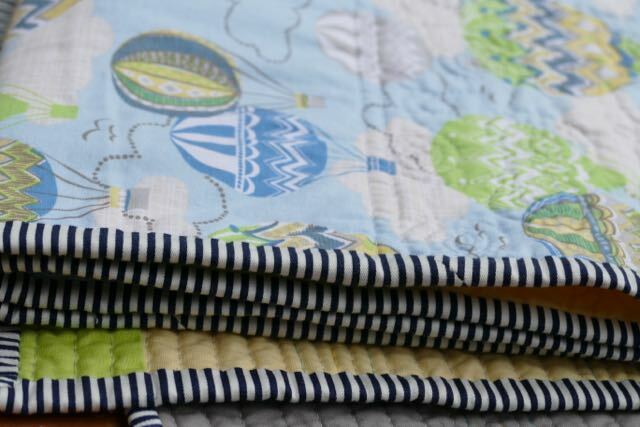 This quilt has been gifted to my new little nephew who was born in London - perfect! Perfect! I'm sure it will be treasured! Lovely and unusual. Well done. Interesting approach and turned out really lovely! This turned out beautifully! And what a perfect backing, too. Wonderful skyline! 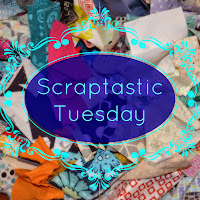 Lucky nephew....Thanks for linking up to #scraptastictuesday! I love how I knew which city this is without hints. It must be an effective skyline! Thats really cool, I love the effect!